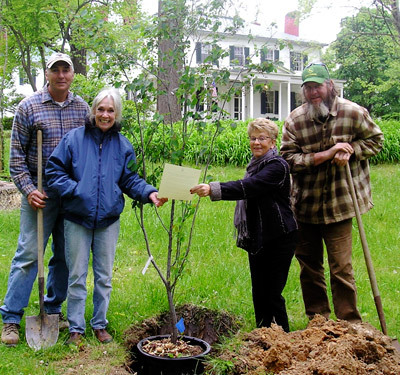 The Berkeley County Farmland Protection Board was the recipient of a WV Project CommuniTree kit to plant 24 flowering trees at the Boydville Mansion in Berkeley County, West Virginia. The tree species included Eastern Redbuds, Flowering Dogwoods, and Serviceberries. Scott Rheam, Boydville’s Caretaker, completed the application and organized the project. The planting caught the attention of WV Senator Joe Manchin, who sent a representative to support Boydville’s efforts to increase their urban tree canopy. Manchin’s representative quoted the Senator as saying that “increasing urban tree canopy is a commonsense solution”. Mr. Rheam was assisted by CommuniTree Representative Herb Peddicord with WV Division of Forestry. The 24 flowering trees immediately improved the aesthetic value of the Boydville property. As they grow they will increasingly reduce stormwater runoff, provide shade and recreation, and grow the properties urban tree canopy. 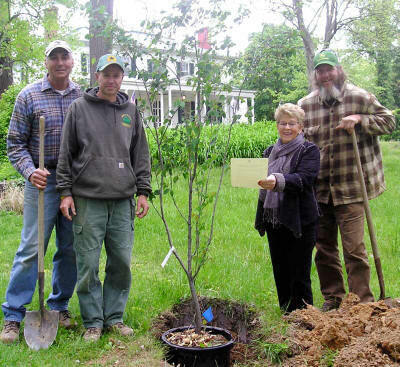 Floyd Kursey, Chairman of the Berkeley County Farmland Protection Board; Herb Peddicord, WV Division of Forestry; Mary Jo Brown, Regional Coordinator for Sen. Manchin; and Scott Rheam, Groundskeeper of Boydville Mansion.